Go even further with the K 1600 Grand America. This fully-equipped touring bike gets you closer to the road than you ever thought possible, without compromising riding pleasure or comfort. Always ready to go the extra mile, the legendary 6-cylinder in-line engine triumphs with an unparalleled smoothness and impressive power. Its design and features are on another level. From the windshield to the distinctive rear with enough space for two passengers, all the way to the easy-to-use top case and backrest, there’s an understated cool about the Bagger. The Grand America makes the horizon seem boundless-and yet within reach. No matter how long your dream ride might be, you can expect a dynamic experience with the Bagger’s impressive 160 horsepower and 129 lb-ft torque. For when it is time to head back out on the road, reverse assist makes backing out of overlooks and parking spaces effortless. The new BMW F 750 GS and F 850 GS: Premium middle-class travel enduros with strong characters. 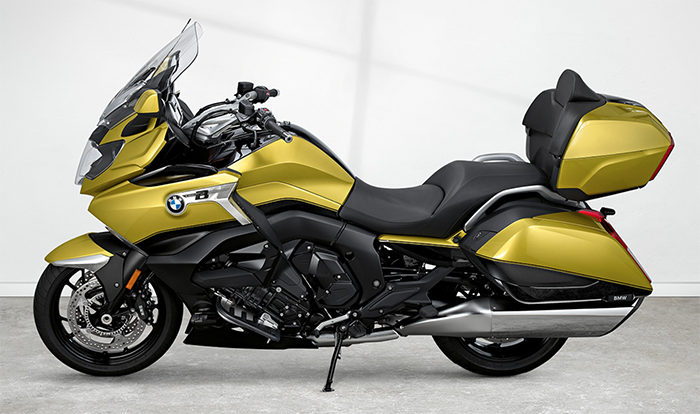 Ever since their debut in 2007, the GS models of the F series have stood for premium riding enjoyment with typical ‘Made by BMW Motorrad’ features, representing the middle-class Adventure segment. As before, the GS abbreviation again represents a perfect synthesis of touring and long-distance capability combined with sporty dynamics and supreme offroad performance. In short: A BMW GS is the perfect companion when it comes to discovering remote corners of the world by motorcycle. After around ten years of consistent model development, BMW Motorrad has now fully redesigned and reengineered its middle-class GS models in line with its objective of creating an ultimate riding machine that is even more uncomplicated and carefree, whether used for sport-oriented road riding, on tour complete with luggage and a passenger, or on an adventure trip into offroad terrain. Even more so than their predecessor models, the new F 750 GS and F 850 GS are targeted squarely at their respective clientele. The F 750 GS is designed for all riders who prefer the sensation and conceptual design of a travel enduro in combination with a low seat height, copious power availability, high cost-effectiveness, and powerful all-round qualities. Opposite this is the new F 850 GS, which besides offering more power and torque, features even more distinctive touring characteristics coupled with supreme offroad ability. Powerful, new 2-cylinder in-line engine with two counterbalance shafts and a firing interval of 270/450 degrees for optimised smoothness and emotional sound. The main development focus was to create an increase in both power and torque. In addition, special attention was given to reducing fuel consumption levels. Displacement is 853 cc and the power output of 57 kW (77 hp) at 7500 rpm generated by the F 750 GS is more than sufficient. The new F 850 GS generates 70 kW (95 hp) at 8250 rpm which translates to a supreme level of engine power. The developers achieved a powerful and emotionally appealing sound by employing a crankshaft with a 90 degree journal offset and a 270/450 degree firing interval. Unwanted vibrations are absorbed by the new engine’s two counterbalance shafts. A self-amplifying, anti-hopping clutch provides a discernible reduction in the hand clutch operating force while the drop in engine drag torque also enhances safety on the road. Power transmission to the rear wheel comes from the 6-speed gearbox with secondary drive that is now positioned on the left-hand side. The riding modes ‘Road’ and ‘Rain’ plus ABS and ASC ensure plenty of riding enjoyment and enhanced safety as standard. Pro riding modes are available as optional equipment. The new GS models address individual rider requirements by offering ‘Rain’ and ‘Road’ riding modes, while the combination of BMW Motorrad ABS and the ASC automatic stability control ensures a high level of safety. The F 750 GS and F 850 GS can be fitted ex works with optional equipment, such as Pro riding modes and in turn the additional ‘Dynamic’, ‘Enduro’ and ‘Enduro Pro’ riding modes (the latter only available in the F 850 GS) as well as the DTC dynamic traction control and banking capable ABS Pro. New steel bridge frame in monocoque construction, optimised suspension geometry and new fuel tank position. The bridge frame of the new GS models in the F series is made of deep-drawn, welded components. It integrates the 2-cylinder in-line engine as a co-supporting element and offers benefits in terms of torsional rigidity and robustness. The fuel tank has been placed in the classic position between the seat bench and the steering head, for optimised packaging and an improved centre of gravity. Sharper GS profile thanks to the more masculine design. The F 750 GS and F 850 GS also feature a completely new look, which benefits from a more dynamic and masculine design. In addition to the basic version, the new F models are also available in Exclusive style variations. The Rallye style variant is exclusive to the new F 850 GS and places particular emphasis on its offroad capabilities. Unique range of optional equipment and Original BMW Motorrad accessories. The new GS models of the F series are being launched with a range of equipment options that is unique for the middle class. Be it the different seat heights and windshields, the new full LED headlight, the optional Connectivity equipment with TFT display or eCall, the list of fascinating features with which owners can maximise their riding enjoyment and safety as well as experience the thrill of the road is now virtually inexhaustible for middle class travel enduro motorcycles. Powerful 2-cylinder in-line engine with a displacement of 853 cc. F 750 GS: 57 kW (77 hp) at 7500 rpm and 83 Nm at 6000 rpm. F 850 GS: 70 kW (95 hp) at 8250 rpm and 92 Nm at 6250 rpm. Extremely powerful and emotional sound, produced by a crankshaft journal offset of 90 degrees and firing interval of 270/450 degrees. New, robust steel bridge frame in monocoque construction for increased riding precision. New telescopic fork/upside-down telescopic fork plus double-sided aluminium swinging arm with central spring strut for more sensitive response characteristics. ABS, ASC plus ‘Rain’ and ‘Road’ riding modes included as standard. Pro riding modes with ABS Pro and dynamic brake light, DTC and the new riding modes ‘Dynamic’, ‘Enduro’ and ‘Enduro Pro’ (the latter only with the F 850 GS) available as optional equipment ex works. ESA electronic suspension adjustment available as optional equipment. A self-amplifying, anti-hopping clutch for a discernible reduction in hand clutch operating force. Full LED headlight incl. LED daytime running light as optional equipment. Connectivity with multi-functional instrument cluster and 6.5 inch full-colour TFT display plus numerous features as optional equipment. Intelligent emergency call function now offered for the first time as optional equipment for the middle class. Optimised offroad and travel ability plus improved wind and weather protection. Sharper GS profile resulting from new design. New colour concepts and style variations Rallye and Exclusive. A range of optional equipment and accessories that is unique in the middle class, such as Keyless Ride, Gear shift assistant Pro, Dynamic ESA, eCall, Connectivity etc.